Will and Kate's World: Trunk or Treat! Jay First Baptist Church participated in the Trunk or Treat activities that Jay United Methodist church does every year. Mt. Carmel Methodist participated this year as well. We had over 100 kids. I am not a huge fan of Halloween so we never do any trick or treating. If the churches do something we let the kids throw on one of their dress up outfits from the toy box and go to that. But this year since our church was participating and I was decorating the car, I let the kids pick something that we could make. 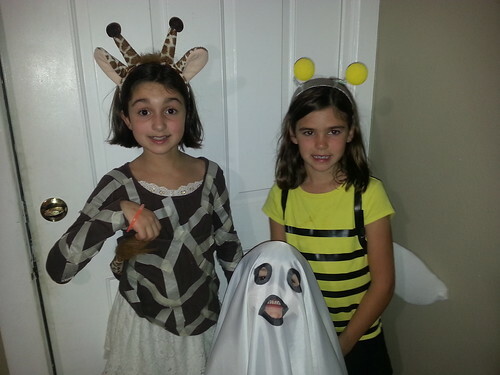 Isabelle wanted to be a giraffe and Anna wanted to be a bee. Luke said he wanted to be a ghost but he never would put on his costume that I made; except just long enough to take this picture. The kids had a great time and ended up sitting on the porch with their friends eating candy all night while they waited on us to finish passing out candy. At one point I was watching Luke walk around with his friend Colton while he Trunk or Treated. I couldn’t help but feel sad that he wasn’t asking for candy and he would tell the people no when they asked him if he wanted any. We have dealt with diabetes for over a year now, but times like this are still painful. 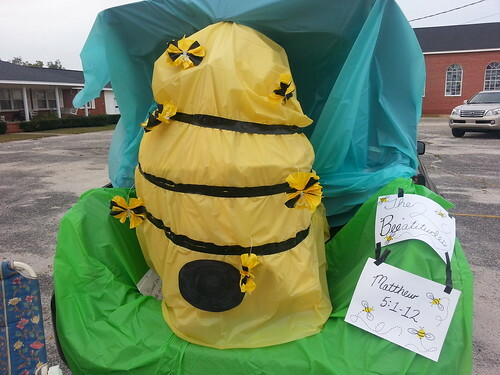 I did a “Bee”atitude theme this year. I wrote out all of the beatitudes but couldn’t make them stay on the car. So, I had to settle for just the title and the scripture reference. Here is a picture of how it turned out.